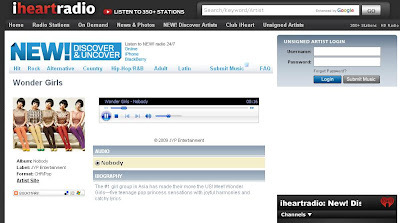 Another great news for the Wonder Girls: they are added on "IHeartRadio.com"! Addition to that, they have been selected as Clear Channel's Artist to Watch. It's so great to hear them getting recognized from many radio stations. If you go to this website, you can see their biography and listen to their first US single, Nobody. [Download] Do you wanna learn Korean? Who are the WONDER GIRLS? WG Sunye gets a b-cake from Jonas Bros.